All the paintings to be taken home are put in one area at the back of the Cottage. There is no room to store paintings at the Cottage Studio, however the paintings that are up on the walls are still ok to be there. By orders of HPS. The last day for entries is March 31, 2011. Judging of the paintings will be Tues. April 5, 2011 at The Cottage Studio after 3:00pm. Innovation Park is located at 175 Longwood Rd. South, Hamilton, Ont. 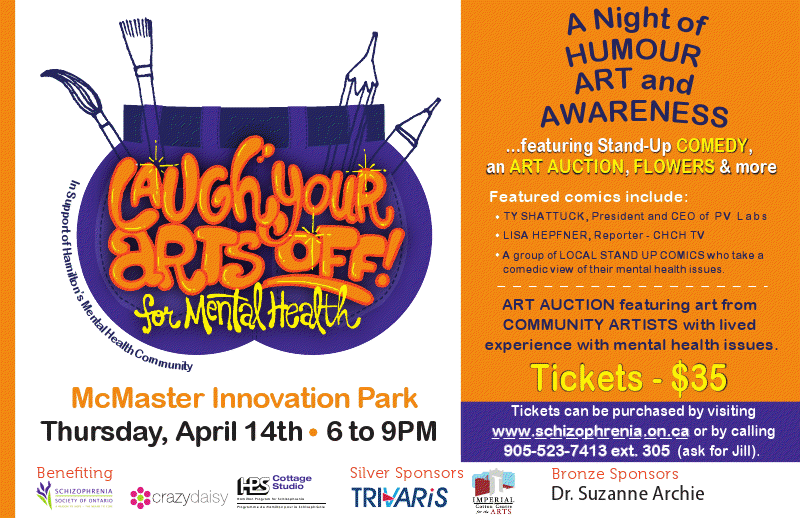 Laugh Your Arts Off is on April 14, 2011 between 6:00pm and 9:00pm. The Pearl Company is showing The Cottage Group for the complete month of April, 2011. Paintings are available for sale. Go check it out. As part of the fundraising effort LYA04MH is seeking visual artists with a lived-experience connection to mental health. You may have lived experience with a mental health problem yourself, have a close family member or friend with a lived experience, have a life connection to a survivor, or simply have been impacted by mental illness. With 1 in 5 Canadians experiencing mental health problems, not only is it our capacity for resilience that provides hope and optimism, but also our ability to reach out and help others to be creative and productive members of our community. LYA04MH is seeking two-dimensional or three-dimensional works in any medium that can be displayed on easels and plinths. Works should be provided in a ready-to-hang condition. Artists are being asked to provide a minimum bid for their works. The minimum bid will serve as the artist fee for each given work, with funds raised beyond that going towards the events overall fundraising target. Artists are welcome to donate the entire sale price but the event organizers do not expect this. A charitable tax receipt will be issued to the artist for the amount raised beyond the minimum bid, or full contribution should the work be wholly donated. Unsold works will be returned to the artist. It is suggested that works have no greater than a $250.00 minimum bid. If you need help determining the amount for your work, guidance can be provided once your work has been submitted and accepted. LYA04MH is seeking 40 pieces in total for the event. Artists wishing to submit works can do so by filling in the "Submission Form" and bringing works to either The Cottage Studio or The Schizophrenia Society Of Ontario, Hamilton Chapter. See below for details. The event organizers reserve the right not to display all works submitted due to the nature of the event and space in which it is being held. Artists whose work is chosen will also be given a complementary ticket to the event and are encouraged to be present during the auction portion of the evening to stimulate conversation about their work and how it relates to their lived-experience with mental health. Laugh Your Arts Off is coming to the Cottage Studio in a short time. They will be choosing the paintings that are for sale at an Art Show auction.. Details will follow. Please get your paintings ready and bring them to the Cottage Studio. know.Please try to frame your works so they can be hung. The paintings for the Pearl Company Gallery Show is almost here. The artists paintings that are chosen are to be taken to The Pearl Company starting on MONDAY, JAN. 31,2011 AFTER 1:00PM.We are to frame them the best we can as well as make the cards with the names of the paintings ourselves.